Let's face it, you're probably scrambling to find those last few gifts, what with a little over a week left of shopping time till Christmas. I'm going to hope for you that you've managed to find the bigger gifts on your list, and will switch gears now to stocking stuffers and smaller items to populate those gaps under the tree for the rest of the Countdown to Geekmas. 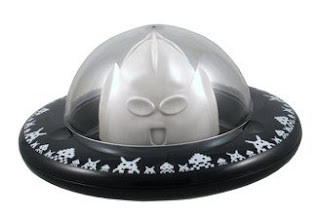 This is one for the alien conspiracy theorist, Space Invaders lover or general nerd on your list: a little touch of Area 51 in the form of an adorkable UFO juicer. Yes, I said: juicer! Come on, how cute is this thing? 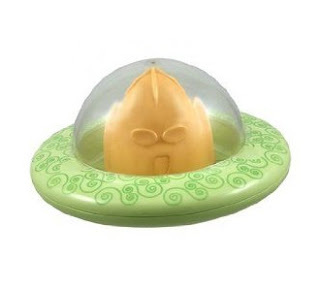 That little alien just looks so darned happy sitting in his little space ship. And his pointly little head is perfectly designed for stabbing with citrus fruits. But the best feature is the pixelated space invaders design all around the border of the flying saucer on the navy one. Pretty sure this would make me smile every time I used it. In fact, I would probably make up reasons to use it. I really love it in navy and white although it also comes in green and pink with different designs. I found it on Geek Chic Boutique (Canada) in green at a great price, and for much more on Amazon (US) although they have all 3 colours available: blue, pink and green. Definitely one of the more unique items you can put under the tree, don't you think?